In the space of a few days from Friday, 6 August, 1915 until the following Tuesday, New Zealand troops, suffered an appalling number of casualties, in first reaching the heights of Chunuk Bair, then briefly defending them, before retiring, after being replaced in the front line by two British battalions (6th Loyal North Lancashires and 5th Wiltshires) during the night of 9/10 August. The following day, 10 August, Chunuk Bair was lost when a Turkish counter attack, led by Mustafa Kemel, swept the British off the crest. In capturing Chunuk Bair, members of the Wellington Infantry Battalion, were the first to sight the ultimate (and never achieved) goal of the Gallipoli campaign - the Dardanelles straits. The briefly held view from Chunuk Bair was the only time the Dardanelles were sighted by allied troops during the whole Gallipoli campaign. 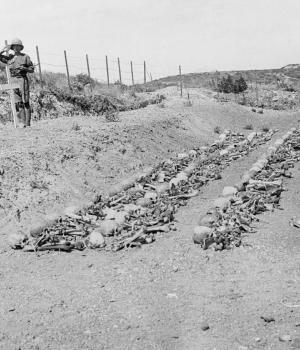 Of the more than 850 New Zealanders remembered on the Chunuk Bair (New Zealand) Memorial and the few that found graves in the Chunuk Bair Cemetery there is at least eight pairs of brothers. There is also a further 17 brothers who had another brother who either died at Gallipoli or died from wounds or disease resulting from their service at Gallipoli. Part of the research of the New Zealand War Graves Trust is documenting relationships between New Zealand casualties both within conflicts and across conflicts. When Lieutenant-Colonel William George Malone was killed at Chunuk Bair on 8 August, 1915 leading the Wellington Infantry Battalion, he was the first of four from that family to die whilst serving in the armed forces. His son Lieutenant Edmond Leo Malone MC, New Zealand Rifle Brigade, died of wounds on 6 April, 1918 and is buried at Wimereux Community Cemetery, France. Another son, Captain William Bernard (Barney) Malone was killed in action in 1943 whilst serving with the Scots Guards in Italy. He is buried at Cassino War Cemetery. And great great grandson, Lance Corporal Rory Patrick Malone, died of wounds received whilst serving with 2/1 Battalion of the Royal New Zealand Infantry in Afghanistan. He died on 4 August, 2012, 4 days short of 97 years after his great great grandfather died at Chunuk Bair. More can be read about the Malone’s by following the links on their names.